At VetShopAustralia.com.au, nothing is more important than the health and safety of our pets. One of the things we feel strongly about is that every Australian household with pets should have a clear, easy way to notify rescue authorities that there are pets in the house in the event of an emergency. That's why we decided that, as a community service, we'd give away these great Pet Emergency Rescue Stickers. Just attach your free sticker at your front door, front gate or other obvious location, and police, fire and SES officers and other rescue authorities will know if there are pets in the house, and how to contact you in the event of emergency. Simply click the link below and fill out the form and we'll send you the Pet Emergency Rescue Sticker, plus a helpful guide to preparing your pet's emergency preparedness plan, absolutely free! what a great idea. 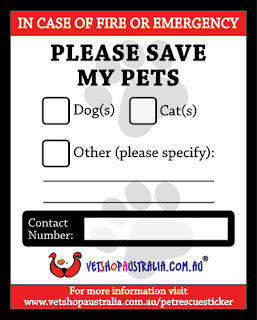 I have seen these sorts of save my pet stickers in America and I think they are a great idea. Thank you so much for this community spirited initiative vetshop. Pets are so much part of our family and with our harsh Australian environment its so important to take care that they are protected in times of danger. Wow this is brilliant! Pets are treated as part of the family that's why pet owners doing all their best to protect them. Pets get back to school blues too!